100-pair 110 patch panel, 1 rack mount space. 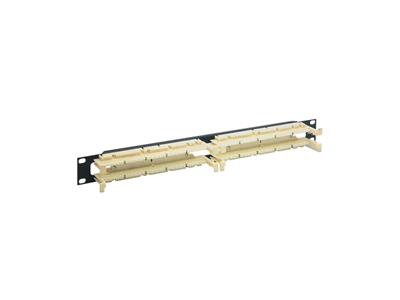 110-rack mounted patch panels ideal for 110-type installations. they are designed with rear cable entry for added flexiblity. Rack mounted reinforced steel panel with two 50-pair 110 blocks. Designed to support the distribution of voice and data needs for commercial or residential applications. Designed with rear cable entry for flexibility. Designed to fit all standard 19 inch racks and cabinets.